One of the sentinel restaurants along the Gulf of Mexico beaches, steps away from striking sunsets. 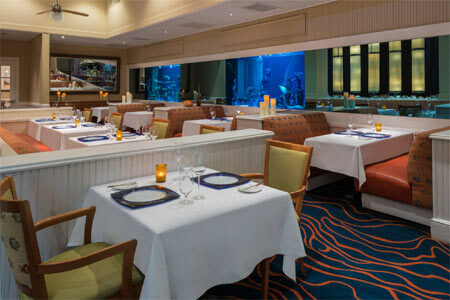 About the restaurant and décor: As one of the most stylish fine dining venues along the Gulf of Mexico coast, Maritana Grille offers the signature cuisine of The Don CeSar hotel in St. Pete Beach. Saltwater aquariums accent the dining room, but look into the private dining room if you'd prefer a more intimate experience. About the food & drinks: The menu reflects an emphasis on local fresh seafood as well as organic vegetables, and there’s an inviting wine cellar storing an estimated 400 labels from around the world. Big spenders can begin with caviar or a seafood platter stocked with shrimp, lobster, jumbo lump crab and oysters. Other appetizers might include lobster coconut bisque, rabbit confit and a Caesar salad with baby kale and frisée. Mains range from classics like cioppino to creative offerings such as ahi tuna with foie gras butter, syrah sirop, garlic greens and yukon potato. For diners who prefer a seafood alternative, the Grille has steak a la plancha, brick chicken and rack of lamb. Desserts vary, although the hazelnut "reveal" makes more a memorable finale. Service is consistently polished and attentive.